It is widely accepted that the flugelhorn was derived from the bugle design by Michael Saurle in the early 1800's. Flugelhorns were named from the German word Flügel which means wing or flank in English. In the beginning, flugelhorn was primarily used on the battlefield to organize the flanks in an army. Flugelhorns are a member of the horn family and a brass instrument that resemble trumpets but with a wider bore. 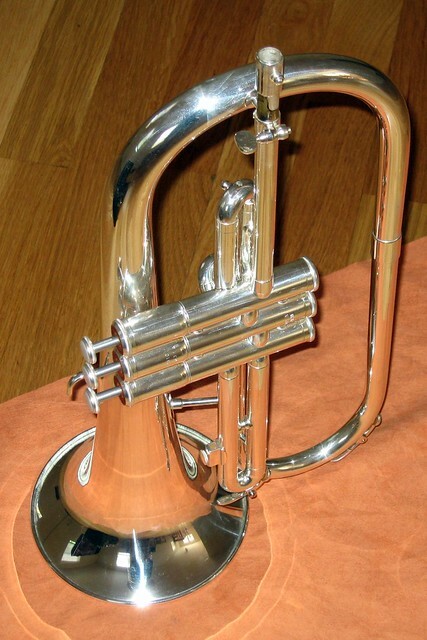 The appearance of the flugelhorn has also been compared to a cornet, although the trumpet is probably a closer comparison. The flugelhorn traditionally has three valves and uses the same piston valve system of other brass instruments. Four valve and rotary valve version exist but they are not the norm. Some modern flugelhorns include a fourth valve as this is becoming more popular. Today the flugelhorn is used in jazz, brass band, and popular music applications. The tone is considered to be fat and mellow compared to a trumpet. The actual sound probably falls somewhere in between a trumpet and a horn. Resources about the flugel horn are hard to find as this is a truly unique brass instrument. If you have a local music instrument store that happens to sell flugelhorns you are lucky and probably want to try one out there. For most people, the best option for locating a flugelhorn will be on the internet. Flugel horns are expensive compared to other brass instruments but you will find that they are worth the price for the true brass instrument player due to the unique sound and playing qualities. It is possible to find good deals on the flugelhorn if you use the proper resources on the Web. For a complete flugelhorn guide visit http://www.flugelhornguide.com for information, articles, and shopping information.